Since 1991, Sonic Youth guitarist Lee Ranaldo and moviemaker Leah Singer have been collaborating on a series of live performances that combine sound and film. 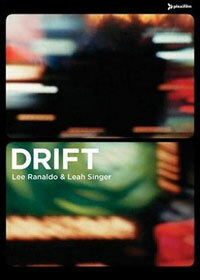 Appropriately called Drift, it’s comprised of poignant, itinerant poetry that glances through decades of Lee’s life supported by dark, meandering electric guitar clouds that blend with blurry 16 mm movie images shot on the road by an apparent errant cinematographer. Like some sort of vintage 1960s double feature flickering simultaneously on twin screens, Leah’s projector clicks and clacks as her imagery unfurls: Flowering trees accompany neon signs. A huge electric arrow points toward GIRLS. Blurred city lights, truck tires, abandoned fire trucks and shoes support an x-ray hand that attempts to “reach out and touch someone,” anyone on a floating rotary phone. These photos combine in myriad, random ways to inspire different stories in each viewer. You are currently browsing the archives for the Lee Ranaldo category.